A “Sensitive Space” by ORTLOS is a prototype for the space which goes beyond the imagination. A Space which underlies Georg Flachbart’s pledge for “disappearing architecture”, it radically expands the Jacques Lacan’s “other” and it is build utterly out of information: light, visual image and audio. Nothing haptic. A meta-machine is tracking the position of the visitors within the space and triggers the composition fragments thereafter. “Sensitive space” is questioning the performative space and space for performance, dismantling the traditional notion of rather static relationship between the performer and the audience. It describes a new art how the collective perception can influence the performance itself and introduces the paradigm “form follows feedback”. The first prototype will be shown within the exhibition “tone.body.space” curated by Charlotte Pöchhacker. Private View on Friday, December the 3rd 19:30 at Kunsthaus Mürzzuschlag. BesucherInnen untereinander im Vordergrund steht. die Interaktion der BesucherInnen geformt werden. der musikalischen Aufführungen. Wie kann der/die BesucherIn diese Aufführung beeinflussen? Das kann experimentell und spielerisch im „Sensitive Space“ erforscht werden. I kind of like the idea of buildings that are more flexible in concept, but here I wonder how much the ability of sensors to attune to a mood of a person would affect the intial response. Would most users prefer to have direct control over the space? Is this a fantasy space? or does it converge with a Gregg Lynn sort of early space ship environment? Mark, the sensors are tracking the position of the users and distance among those. 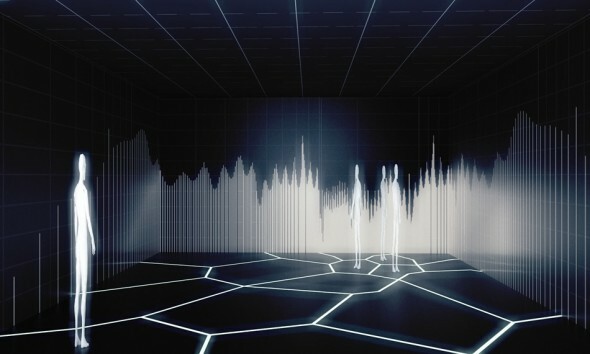 Based on this data, the audio/video composition is triggered and the space is spatialized. The users do not interact with space or computer interface, but are utterly focused on each other. This installation has been realized within our exhibition. Some photos and videos will be posted soon, but in this particular case the live experience of the space is crucial.